Chinook salmon are the largest of the Pacific salmon, and richly deserve their common name, king salmon. In their four to seven years of life, they grow to an average of over 15 pounds, but it is not unusual to see them over 30 pounds. One CSMA fisherman, Joe Craig, once caught a 64 pound king salmon near Elfin Cove which was the record fish of that year. The next day, however, another CSMA fisherman, Dennis Montgomery beat him with a 65-pounder. The troll fishery in southeast Alaska usually targets kings for a few weeks in July and perhaps a week in August. After hatching from the gravel, usually in large mainland rivers, the young king salmon spend about six months feeding and growing in freshwater before migrating to sea. In the ocean, kings migrate vast distances, traveling a thousand miles or more in each of their two to five years at sea. Because they cover such great distances, many of the kings caught in Alaska originate in rivers in Washington, Oregon, or British Columbia. 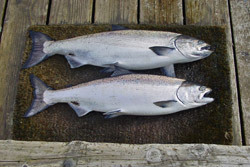 Chinook are the least abundant of the Pacific salmon species. Their dependence on large rivers for spawning and rearing habitat limits the number of kings produced coastwide. Habitat degradation, including hydroelectric dams which block downstream migration of juveniles, and upstream migration of spawning adults, has further reduced chinook abundance. Consequently, both commercial and sport fisheries are restricted in how many kings they can harvest, with management agencies paying careful attention to returning enough spawners to the rivers to sustain the runs. When they enter the rivers on their return migration, chinook stop feeding, and live on their stored fat. To prepare for this migration, they feed heavily and store energy in their flesh as oil, rich in heart-friendly omega-3 fatty acids. Their large size and oil-rich flesh make kings ideal for grilling, either as filets or as steaks. Kings also make luxuriously rich smoked salmon. Another favorite species of both the commercial troll fishery and the sport fisheries, most coho caught in southeast Alaska originate locally, in the streams of the Tongass National Forest. Coho usually spend one year as juveniles in the streams, where they depend on cold clear water, and on the cover provided by the riparian vegetation. Through the diligent efforts of fishermen and others concerned with habitat quality, most of southeast Alaska remains forested, and the pristine streams support healthy coho populations. In the spring of their second year, coho migrate to sea, where they spend about 18 months feeding and growing before returning to spawn. On their return migration, they feed voraciously, more than doubling their weight in the last few months of their life from an average of about 5 pounds in early July to over 8 or 9 pounds in September, occasionally reaching up to 20 pounds before they spawn. Like kings, coho are also excellent grilled, baked or smoked. Although sockeye salmon are not commonly caught by trollers, Cross Sound lies on the migration route for several of the largest sockeye runs in southeast Alaska, and a limited number of sockeye are taken by the Fairweather Fish trollers. Sockeye are the only species of Pacific salmon that require freshwater lakes for rearing habitat, so they are produced only in systems draining lakes. The young spend a year or two feeding on plankton in the lake before they migrate downstream. While at sea, they continue their plankton-feeding habits, and grow to an average of five or six pounds before returning to spawn. Adult sockeye spend a month or more in their lake, ripening up their eggs before spawning, and because they do not feed when they reach freshwater, they live off of reserves of oil in their flesh. That oil gives them a rich flavor and an unmistakable texture. Although many sockeye caught in Alaska are canned, those caught by the Fairweather Fish trollers in Cross Sound are sold fresh or frozen. 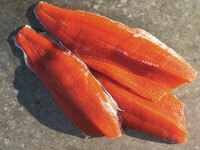 Sockeye are also called red salmon because of the deep coral color of their firm meat. They can be grilled, oven-baked or smoked. The smallest of the Pacific salmon, averaging about three pounds in size, pinks, or humpies, are caught mostly by net fishermen in Alaska, and processed in canneries. Yet some trollers also catch pinks, which can be sold fresh or frozen. Pinks spawn in streams of all sizes in southeast Alaska. Immediately after hatching, the young migrate downstream to the estuary, and then to sea, where they feed on plankton and small fish. Like clockwork, pinks return in their second year of life, so even-year and odd-year pinks spawn as separate populations. Because they do not spend much time in the streams, they can spawn in even small seasonal streams that might dry up in the summer, and they are by far the most abundant salmon in Alaska. On their return migration, the pinks are so abundant that the waters of southeast Alaska come alive with schools of pink salmon. The light, delicate flesh of the pink salmon can be baked and takes on the flavor of herbs that it is cooked with. Leftovers (if you have any) can be used in salads and sandwiches. Like the pinks, chum salmon spend very little time in the streams, and migrate to sea shortly after hatching. Their diet at sea is similar to that of pink salmon, but they remain at sea longer â€“ some up to age 5 â€“ before returning to spawn, and they grow to 10 pounds or more. In many areas, chum are caught by net fisheries, near their spawning streams, where the fish are dark and the flesh is pale. In Cross Sound, however, trollers catch chum while they are ocean-bright, and the meat is good quality. The filets can be baked, and they lend themselves well to smoking. In addition, chum salmon are prized for their large eggs, which are processed into caviar, primarily for Asian markets.